Join Us!!! We are looking for someone to help us cover USBL basketball. Please send us an e-mail. Re-born at 28 years old? His name is Gregory Plummer (6'4''-G-83, college: Eckerd) and that might be the best way to describe the 6-4 shooting guard/small forward they call The Purist. How else would you label the summer of 2011 for the 28-year old who took over the New York Summer league circuit, on his way to being named Nikes Player of the Summer at the annual Tournament of Champions earlier this month. Considering Plummer did not even play professionally this past season or last summer after rehabbing from surgery on his ankle which had been plaguing the Brooklyn, NY native the past two-plus years, the moniker is fitting. Plummer was integral to the success of the X-Men, coached by Staten Island Vipers (ABA) Head Coach Dytanya Mixson , who captured the West 4th Classic as well as EBC (Entertainers basketball Classic) titles before falling to Team Nike (Dyckman) in the TOC Finals. Plummer averaged an astonishing 41 points per contest in the West 4th playoffs and for the last two-months has been the talk of the tri-state area, something you could not have imagined at the beginning of the year. While rehabbing, Plummer was a teacher in Westchester trying to pay the bills and make ends meet, but also during his rehab, he took the time to learn some new moves and tricks which he put on display this summer. Always a gifted shooter, (basically playing on one leg for Halifax of the Premier Basketball League in 2010 he still shot 50.0% from the field and 38.0% from behind the arc), Plummer worked on developing a more varied offensive game; inclusive of post-up moves and improved ball-handling as well as further refining his jump shot. Though Plummer had a very productive High School career at Transit Tech HS in East New York, he went to unheralded Sage JC (Division II) before furthering his development at NCAA DII Eckerd College. Despite going the DII route, Plummer landed his first professional job in Luxembourgs second division during the 2005-06 season with BBC Nitia Bettembourg. After an abbreviated 11 games overseas, NY was calling him home and there during the 2006-07 season was where he would emerge on the professional scene with the now defunct Strong Island Sound of the American Basketball Association (ABA). Under Coach Mixson, Plummer blossomed into an All-Star on the back of averaging 20 points per contest while leading the Sound to the second round of the playoffs. However, the end of the 2008 season would be the beginning of the troubles for Plummer, specifically his ankle. Never wanting to stop and truly rest or try to recover, Plummer would play the next seasons between the Continental basketball Association (CBA) and PBL, where he finished with Halifax in 2010, hobbled and unable to match the level of performance he had come to expect. Today, fully recovered and coming off of the summer of his re-birth Plummer takes some time to talk about the last two months, his ups and downs and where he see himself going this season and beyond. Surujh: First off congratulations again on being named Nikes Player of the Summer. What does the award mean for you? Greg: It means a great deal to me and my career because it shows that I accomplished something that a lot of people didnt think I could. A lot of people didnt expect me to come back and be as productive as I was before the injury. Then to come back and win two championships, two MVP awards in two of the major leagues in New York City no one expected me to be playing at that level , but I knew that I could and I did. I didnt want to just come back and show that I could run up and down the court, I owed it to myself to show that I could perform at a high level and win. Surujh: What are your thoughts on the TOC Championship game loss against Team Nike? Was it just a matter of wrong day and wrong time? Greg: It was a matter of them scoring more points than us. Its as simple as that. They were the better team that day and they are the champs until next season. Surujh: Regardless, it was a summer to remember for you personally. What did you expect coming into the summer tournaments? Were you mentally and physically ready? Greg: I was definitely mentally and physically ready for the summer. My physical health was never a concern for me because I knew I was ready. I was home all winter and waiting for all the guys who play Professional ball to come home so that we could take them out. Thats something I was looking forward to because I had the opportunity to play with my X-Men brothers again and we always have a really good chance of winning no matter who we play against. Surujh: Tell me a little about your last year and half for you, the injury, your rehab and not playing. What kind of affect did that have on you? Greg: Without question the toughest and most frustrating time of my life. I wanted everything to happen fast. I wanted a speedy recovery, rehab, and just wanted it to be in the past. Sometimes it takes a while for your body to respond to the physical demands of professional basketball. I learned a lot of valuable lessons. As much as I hated it at times, I believe that I am a much better person and basketball player because I went through this. Being on the sidelines for that long wasnt easy but it made me hungrier and motivatedmore than Ive ever been. Surujh: About your rehab, I read in the Post (NY) article that you spent time working on other aspects of your game in your training regimen. What did you focus on and what type of work did you have to put in? Greg: I had to focus on getting my body stronger and making my game outside of shooting the ball more efficient. I worked out with Lamont Harris in the winter and spring. Everything we did was high intensity, fast paced and physical. Along with the workouts I used the winter leagues and spring leagues to get me ready for summer. Surujh: What kind of feedback and response did you get from the NYC fans this summer? Greg: I surprised a lot of people. Nobody outside of X-Men expected me to play the way I did. It was fun to see guys who I always play against trying to adjust to the new things I added to my game. It was even more fun to see other coaches sending a bunch of different guys at me to slow me down. The most fun of all is the look on all of their faces when they focused on me and forgot that we had Tommie Eddie (6'7''-F/C-82, college: Mississippi) and Chris Wehye (6'7''-F-84, college: Quinnipiac) and that it led to championships. Surujh: With many seasons about to get underway overseas and in the US minor leagues, where do you have your sights set for this season? Greg: I have a few teams interested but no deal has been made yet so Im just waiting to see what happens. Im just excited about the opportunity to be playing pro ball again. Surujh: What can Gregory Plummer bring to the table for a pro club overseas? Greg: A professional, passionate, hard worker, and someone who is hungry for championships. Afrobasket 2009 began this week in Libya, where 16 teams from will vie to b crowned as the Champions of basketball in Africa (and earn a spot at the 2010 FIBA World Championships). Several former players from the NBA D-League, ABA (American basketball Association) and USBL (United States Basketball League) are taking part in the tournament and will try to help their nation go for the gold. The tournament began on August 5, and runs through August 15. Aloysius Anagonye (NBADL): Played with the Los Angeles D-Fenders during the 2006-07 season, appearing in 23 games before moving to Italy. The forward averaged 10.2 points and 5.7 rebounds during his time in the D-League. The Former NCAA Champion (2000) with Michigan State has been a member of the Nigerian National Team since 2006. Began the 2008-09 season In Israel before leaving the team in January. Jeleel (Deji) Akindele (NBADL): Has spent parts of three seasons in the D-League (05-07, Fort Worth / 07-08 Iowa) and recently participated in the NBA Summer League with the Portland Trailblazers. The lanky 7-1 center out of Chicago State ranked second in Italys Serie A in blocked shots this season, averaging 1.6 in 33 games for Scavolini Spar Pesaro. Michael Efevberha (NBADL): A newcomer the the Nigerian National Team, the American born Efevberha has spent the majority of his pro career in the D-League since leaving Cal-St. Northridge after the 05-06 season. His most successful campaign came in 2007-08 where he split time with Iowa and Anaheim, averaging close to 15 points per contest. He spent the 2008-09 season with the Wellington Saints of the New Zealand NBL, where he led the league in scoring at 27.2 points per game. 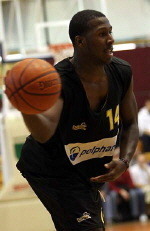 Ebi Ere (6'5''-G/F-81, college: Oklahoma) (USBL): Probably the most prolific scorer in the entire tournament, Ere, a former Oklahoma Cowboy, suited up for the Oklahoma Storm during the USBL 2005 season. In 23 games he averaged 18.7 points and 4.1 rebounds while shooting 48.5% from the field on his way to an All-USBL First-Team Selection. Making a name for himself in Australia, Belgium and Puerto Rico, Ere will take his game to Italy next season where he will suit up for Pepsi JuveCaserta. Ejike Ugboaja (NBADL): A 2006 NBA Draft Pick (#55) by the Cleveland Cavaliers, Ugboaja split the 2007-08 season with Albuquerque (14 games) and Anaheim (30 games: 5.8ppg, 6.1rpg). He spent the 2008-09 season playing in Iran. Gabe Muoneke (NBADL): The 31-year old veteran swingman (and blogger) is one of the most impressive forces on the basketball court. A veteran of the Nigerian National Team since 2003, Muoneke most recently played in Puerto Rico and has played three season s in the D-League with Columbus (01-02), Roanoke (02-03) and most recently with Rio Grande Valley (07-08). Errick Craven (NBADL): Former USC Trojan makes his first appearance at the African Championships after coming off a sensational season in France. Playing for Clermontois in Frances second division, Craven led the league in scoring (19.7ppg), steals (3.1spg) and was fifth in assists (4.7apg); All this while shooting 60.2% from the field. Craven suited up for the Los Angeles D-Fenders during the 2007-08 season. Alfath Belgasem (6'6''-F/G-80, college: St.John's) (Alpha Bangura) (USBL/NBADL): Belgasem, or Alpha Bangura as he is more commonly known, was born in Sierra Leone and starred at St. Johns in New York, but owns passports from Libya in addition to Sierra Leone and the USA. The high-flying swingman has extensive experience across the globe and last season split time with Rio Grande Valley (18.9ppg in 26 games) and Bakersfield, where he was traded in March (9.1ppg in 9 games). He has also played for the Brooklyn Kings of the USBL (02), as well as North Charleston for two seasons after leaving St. Johns. Soumaila Samake (NBADL): A veteran center (7-1) who has NBA experience having played with New Jersey and the Los Angeles Lakers. Samake spent part of the 2002-03 season with the Greenville Groove, where he averaged 8.2 points, 5.7 rebounds and a league-leading 1.6 blocks in 33 games. He spent the 2008-09 season playing in China. Modibo Diarra (ABA): Attended High School in Massachusetts as he prepped for four uneventful years at Memphis. Later he played for the Cape Cod Frenzy of the ABA. A member of the Mali National Team since 205, Diarra played this last season in Tunisia. Ruben Boumtje (NBADL): Veteran center of one time Center University Georgetown, Bumtje has NBA experience with Portland and spent this last season playing in Germany for Oldenburg. Spent the 2004-05 season with Fayetteville where he averaged 6.9 points, 7.5 rebounds and 1.6 blocks in 38 games. Pape Sow (NBADL): Former Second Round NBA Draft Pick (#47) by the Toronto Raptors in 2004, Sow spent part of the 05-06 season with the Arkansas RimRockers where in 18 games, averaged 19.7 points, 11.6 rebounds and 1.6 blocks. Was out of the NBA by 2007, and spent the last two seasons mainly in Italy. Marques Houtman (ABA): New Bedford, MA native, Houtman was a NCAA D3 sensation at the University of Massachusetts-Dartmouth and spent the 04-05 and 05-06 seasons with the Boston Frenzy of the ABA. Matt Miller (ABA): Played with the Houston Takers of the ABA during the 2007-08 season; Member of the Rwandan National Team since 2007. Rob Thomson (ABA): Became a nationalized Rwandan in 2007 before the Championships in Angola. Played with the Newark Express of the ABA during the 05-06 season and played this season in Romania. John III Thomas (5'9''-G-76, college: St.Francis,NY) (more affectionately referred to as Mookie) is a well-traveled point guard who recently finished up another successful season by helping lead Al Ittihad Alexandria to the Super League Championship in Egypt. One of the quicker guards you will find at the international level, Mookie has won championships on several different continents over the course of his career. Equally adept at leading his team in scoring as he is being solely a distributor, Mookie has a wealth of basketball experiences and took some time to share his thoughts with me on this past season, his career and the future. Q.What have you been up to the last few weeks since the season in Egypt ended? A.Well since Egypt ended Ive just been resting and spending time with my family. I lost my father at the very end of the Egyptian season so now Im just here spending a lot of time with my mother and making sure she is ok and comfortable. She lost not only her husband but her best friend so its hard on her, so Im just being here for her and my little ones as well. Q.Almost a month after leading Al Ittihad Alexandria to the League Title in Egypt, how does it feel? A.It feels good to lead Al Ittihad Alexandria to the league title because they hadnt won in 10 years so it felt good to help them finally get a title after so long, and it adds another championship to my collection. Q.Youve won a lot in your career; USBL, Great Britain, Arab Club Championship titles, etc does any one title stand out more than the others? A.You know what, England was nice because it was my first time playing in Europe and the Jordan league championship was nice because in both series we were down and came back to win and Egypt was nice because we were the underdogs and people said we didnt have a chance to win but we won it! They all were nice. In the USBL with the ValleyDawgs, when we beat my home team of Brooklyn, Arab Championship was nice too because I had fun and I was part of an amazing team (Nate Johnson (6'7''-F-77, college: Louisville), Rasheim Wright (6'4''-G-81, college: District of Col.), Jamal Sampson (6'11''-F/C-83, college: California), etc...) and coach in Maz Trakh so they were all nice. Q.After a successful career at St. Francis (NY) you stayed home for a few years playing in US minor leagues before heading overseas to play. Why the wait to cash in? Q.You have a lot of experience playing in the now defunct United States Basketball League. The league had a long history and helped develop a lot of successful players both for the NBA (Raja Bell (6'5''-F/G-76, college: Florida Intern. ), Adrian Griffin (6'5''-G/F-74, college: Seton Hall), Devin Brown (6'5''-G/F-78, college: UTSA)) and foreign leagues (Mike Campbell (6'6''-G/F-75, college: LIU Brooklyn), Sean Colson (6'0''-G-75, college: Charlotte), Jimmie Hunter (6'5''-G-77, college: Life), Immanuel McElroy (6'4''-G-80, college: Cincinnati), etc). What are some of your memories from playing in the USBL? A.The USBL was fun. I have a couple of memorable moments. My greatest memory of course was when I didnt play the first three quarters because of an injury to my shoulder, but Darryl Dawkins needed me because I think Tim Winn (5'11''-G-77, college: St.Bonaventure), Joseph Crispin (6'1''-G-79, college: Penn St.) or Quincy Wadley (6'4''-G-78, college: Temple) got hurt or in foul trouble (Darryl Dawkins always played three guards). He put me in and I had 15 points in the fourth quarter to beat Brooklyn in the championship game. That was a beautiful thing. Also I remember when we lost Fred House (6'5''-F-78, college: S.Utah) because he went to an NBA Mini-Camp and we played in the final four against Devin Brown (and the Oklahoma Storm). Fred House (6'5''-F-78, college: S.Utah) was our best player besides Junie Sanders (6'4''-G-72, college: Cent.Oklahoma) and Devin Brown scored like 55 points on us and we lost; that when I was with Adirondack. Oh, and playing against Roy Jones, Jr. (Brevard Blue Ducks) and playing with Terrell Owens (Pennsylvania ValleyDawgs). Q.For the majority of your career you played strictly in the USA and Europe. In 2008 you headed to Jordan to play for Zain and then this season played for Sporting Al Riyadi Beirut (Lebanon) and Al Ittihad Alexandria; why the change? A.I dont know. I needed a change and Europe and the USA were not for me so I tried out the Middle East and enjoyed it, so thats where I enjoy playing now. Q.How would you compare the differences between European basketball and basketball in the Middle East? What about the lifestyle adjustments youve had to make? Q.What were the Single greatest and single worst points of your basketball career? A.The single greatest accomplishment in my basketball career would have to be winning a championship in Africa (Egypt). I enjoyed that because we were really the underdog and people didnt think we could do it and they said it publicly on TV that we were not good enough to win the league and we WON... AL ITTIHAD! The single lowest point of my career was when I was in Germany and we finished third or second from the bottom. Even though I averaged 18.5 points and finished in the top 10 in scoring and made the All-Star game, we were still losing. Losing is not a good thing; plus the fans in Giessen Germany were amazing fans, they deserved a winning team. Q.With the season wrapped up, what is a typical day for you during the off-season? How much time do you take off away from the gym to recover before getting back into training? A.Well my normal day is waking up, taking the kids to school, going to spend time with my mother, picking the family up from school and work then going home and playing video games with my boys. Family is everything to me. Well my last game was May 15th and I hurt my ankle, so I just rested up and I started working out yesterday June 8th. I ran three miles did some circuit training and today I will play ball for the first time since then. Q.What are your plans for the summer? A.My plans for the summer is to play in a couple of summer leagues, and just enjoy my summer team which are the Diamonds. Trying to win some summer leaguesthats it. Also taking family tripsI love my family. SHOUT OUT TO DIAMOND AND ALL MY DIAMONDS! Q.Do you have any thoughts or ideas on where you want to continue your career next season?